Another great way to give your support is to purchase a banner or sail with your business logo or personal message. Banners will be displayed at the Sailing Center for all to see. Logo sails will last for years to come. Additionally, you can become a HS Program Sponsor. 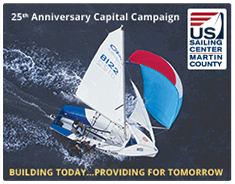 All proceeds from this fundraiser will support the High School Sailing program insuring quality boats and coaching while keeping individual sailor participation costs low. We make sure that no student is turned away due to financial hardship.